Considering the advanced security, Magento is upgrading on daily basis. As a result, the recommendations for owners and file systems are updating with time. Here we will discuss Magento permissions for the following Mage versions. Although Mage permission and merchant privileges might differ from each other. There are two types of Mage file systems described below regarding terminology. Hosting server is the location of Mage server. You simply do not have root access on this kind of server. Further the general user acts as a web server. Just log in as a general user to control the web server. In this case your Mage store assumes you as owner of files under system DIR. Therefore, use “chmod” to edit permissions on directory files and folders. In these kinds of file system, you’re on the cruising seat. Unlike with the hosted system here you can root the system. Both “chown” and “chmod” are familiar for these jobs. Here few most familiar combinations are discussed undertaking the use by coders. If you’re using a dedicated server and you have access to root, you can change the permissions to the installed Mage directory and so on subdirectories. Here we are assuming Ubuntu as your file system. Hence in Ubuntu Apache often runs as www-data. So, enter the following code for Ubuntu. Suddenly setting up above Mage permission as above certainly cause an error. Specifically, the warnings look like the following. How to set temporary permissions? In Ubuntu you can access using following path /var/www/magento. Hereafter you can smoothly run Mage connect manager to install extensions. Here are the few steps to follow for installing Mage extensions using Mage connect manager. 1.Firstly set 700/600 permissions on your Mage installation dir and subdir on a temporary basis. 2.Secondly you can install the required extension. 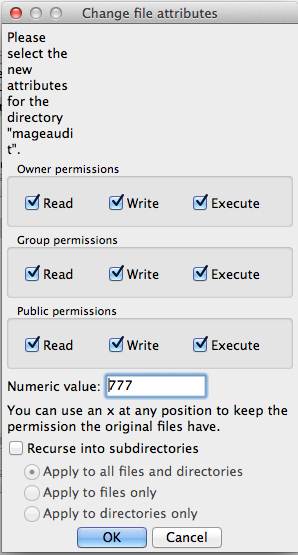 3.Thirdly Mage connect requires 777 permissions to install extensions. 4.Finally reset the permissions to previously recommended values. Further information is available in Mage official for systems using Unix & CentOS etc. However, there are very few owners whom are familiar with the systems like Ubuntu, Unix and CentOS etc. Also the mage permissions are quite difficult to understand. Afterall we always want it simple. You can simply change permissions using cPanel by Aspiration hosting. Our plans begins at $9.99 per month.